My mom used to make this in a skillet on the stove. About a year ago I decided to try it in the slow cooker and it worked out great. I thought I was so clever until I saw the idea on Allrecipes.com this past week. I wasn't as original as I thought. We always served this over white rice, but it would be just as good with mashed potatoes. Heat oil in a skillet over medium-high heat. Sprinkle steak with salt and pepper. 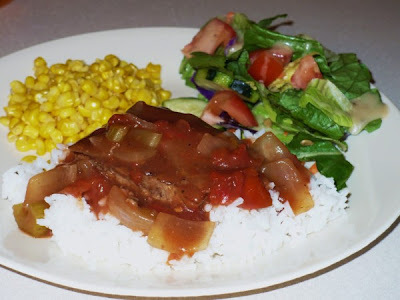 Brown steak on both sides and place in bottom of slow cooker. Reduce heat of skillet to low and add beef broth. Simmer for 2 minutes then pour over steak. Layer onions, celery, and tomatoes over steak, cover and cook on low for 8-9 hours or high for 6 hours. Remove steak pieces to plate and cover with foil to keep warm. Pour sauce and vegetables into a saucepan. Bring to a boil. Whisk in cornstarch mixture and cook, stirring constantly, for two minutes. Serve over steak.